Someone in the Chandos art department seems to have a fixation on sleeping women. 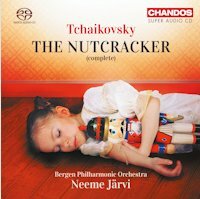 With the release of The Nutcracker Neeme Järvi and the Bergen Philharmonic Orchestra completed their Tchaikovsky ballet trilogy and, curiously, each of the CD’s in this series features a reclined lady on the cover. Fair enough in the case of The Sleeping Beauty, but that floating ballerina corpse for Swan Lake was bizarre and now again we get a sleeping girl with a nutcracker doll in her arms. If this is their idea of an art form which is all about movement and energy, then somebody needs to hand these guys at Chandos a few tickets to attend a ballet performance once. 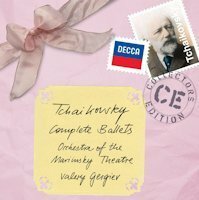 In any case, these Tchaikovsky recordings have been rather peculiar in general, thinking of the oddities in the scores that were used, like these anomalous harp cadenzas in both Swan Lake and Beauty, but above all because of a maestro who seemed determined to disprove that old myth that ageing conductors have a tendency to slow down and become sentimental. Not so 77-year-old Neeme Järvi. The Nutcracker has been done on a single CD before. With 84:35 Järvi isn’t even the fastest in the world, but as we all know it’s not merely about tempo choices, rather about what you do with them and how you balance them in the light of the score’s intent. With such brisk speeds the Overture and the opening numbers of the ballet can still pass on disc, even if the first grins might appear and some listeners will be thinking that this Christmas party isn’t one they would send their kids to. Still, the Bergen Philharmonic miraculously continues to ensure magnificent color and detail. Where Järvi lets us down, however, is in the bigger numbers, when the music suddenly becomes “serious”, starting with Act I, Scene 6 (track 7 of the CD – usually called the Departure of the guests), the ensuing Battle with the mice (track 8) and the grand transformation of the room into the winter pine forest (or when the nutcracker doll turns into a dashing prince – track 9). Here his hasty conducting smothers every sense of feeling (forget poetry and magic), and unsentimental turns into uncaring. At this point Järvi also throws in this disc’s oddity by adding a rather hilarious bim bam clock chiming ten at the beginning of the Departure of the guests, only to be followed three minutes later by the clock striking midnight. This may work on stage, but Tchaikovsky did leave that ten o’clock out of the score for a good reason. The scene of the growing Christmas tree is a speed contest, the battle is running after its own tail and the crucial transformation misses theatrical impact. It suffices to relisten to Evgeny Mravinsky and the old Leningrad Philharmonic to understand what can be found behind the notes – and he wasn’t exactly a sentimental slob either. Järvi’s own transformation seems to take place with Act II, at least for a moment. In the opening scenes he finds warmth, orchestral splendor and an agreeable flow. The Divertissement is mostly well handled, too, again with remarkable playing, particularly from woodwinds and harp. Yet the Waltz of the Flowers is disappointing by its lack of dynamic contrast, its brisk tempo and quickly tiresome rubato. The Andante maestoso is coolly dispatched and only of passing interest compared to those who hadn’t forgotten its connection with the theatre. An admirably responsive and often brilliant Bergen Philharmonic, superb SACD sonics and instructive liner notes from David Nice can’t conceal this Nutcracker is a pretty uneven affair, as is the whole Tchaikovsky ballet series from Bergen and Järvi. And still some continue to pretend that ballet music is easy to play. Categories: CD reviews | Tags: ballet, ballet music, Bergen Guttekor, Bergen Philharmonic Orchestra, Bergen Pikekor, Chandos, CHSA5144, classical net, Marc Haegeman, Neeme Järvi, Piotr Ilyitch Tchaikovsky, Russian music, Swan Lake, The Nutcracker, The Sleeping Beauty | Permalink.